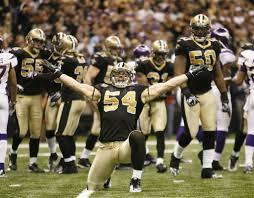 A new bill could affect workers compensation for Saints players in playoff games. So much so that the NFLPA may not agree to expand the number of playoff games. Pro athletes are subject to the same workers comp laws as everyone else - electricians, maids, steamfitters, clerks - everyone who works for a living. And they need to have that protection because their careers are often very short and the risk of serious injury is high, as anyone who follows the NFL knows, there is a significant link between repeated concussions and brain damage later in life. And athletes in all sports get hurt every day - ending or reducing careers. So the Louisiana House of Representatives recently passed a bill that defined, or changed the definition of, how the weekly wages should be calculated for professional athletes who have variable wages. Variable wages are wages much like commission. They must be earned every time to obtained, very different from a monthly salary. In some cases they are called, 'pay at risk'. Athletes are some of many people who have variable pay. Meaning, athletes are paid for their performances and that is why there are some athletes who are paid higher than others--based on how well they perform. Now many of us would trade our pay for that of an athlete---but according to this new bill in Louisiana, we should be happy we get our monthly salaries. "If an employee has a written contract for hire, and that written for hire provides variable wages dependent on the employee's activity job description, job statues...average weekly wage shall be calculated as the employee's actual earnings at the time of the injury...Any written employment contract that does not provide for the same wage for each pay period during the entire term of the contract shall be deemed to be a variable wage employment contract..."
Meaning, if a player was hurt during the post season (play offs), their workers compensation would be calculated based on what they are getting paid around the time they are injured. For many athletes, they do not make the same amount of money in the post season as they would in the regular season games. Yes, they still make more than the average 'Joe', but it drastically decreases income during post season games. They make their entire earnings during the 17-week regular season. So, when teams are playing a game that week, they will be paid. But when you factor in a 'bye' (a week when a team is not playing), they are not making any money. So if a player was injured during a practice during one of these 'bye' weeks, how would we average his workers compensation benefits on his weekly average if he did not play and get paid for that week? The NFL wants to add two more games to the playoff season---taking it from 12 games to 14 games. Considering this new bill passed in Louisiana, it would have to rethink this because it would not benefit Saints players. And it seems odd that a state would reach out to "protect" NFL owners (by reducing the amount of injury compensation they may have to pay) in light of all of the medical evidence on the long term effects of concussions from football and the NFL's recent settlement. Athletes are no different from those of us who have a 'regular job'. If they get hurt, they can no longer do their job. Much like people with a 'regular job', they can file for worker's compensation and get information they need to protect their health, career and family. Everyone, including athletes, needs to be protected on the job.